Brief Description: The Juggernaut returns with vengeance on his mind, but what will he do when he discovers that Professor X is dead? And the conclusion to the origin story of Iceman! This issue begins on a somber note with the X-Men visiting the grave of Professor X. While they are mourning, and FBI agent approaches them and tells them that they have urgent matters to speak about. The X-Men bring the FBI agent back to the mansion, but Foggy Nelson (Daredevil’s law partner) is there waiting for them when they return. 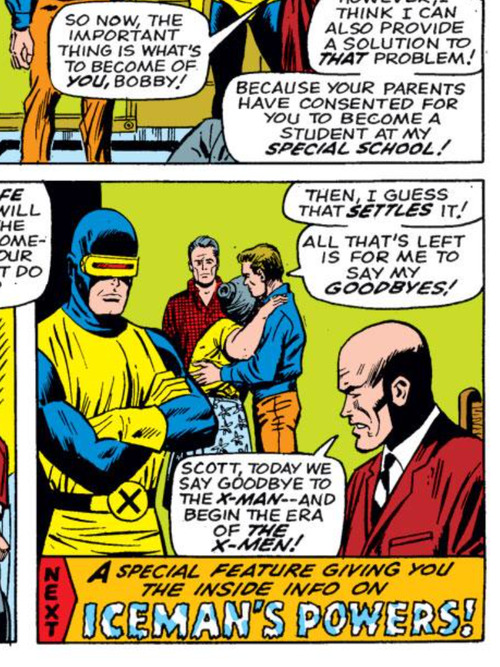 Foggy reads them Professor X’s will where Xavier leaves Cyclops in charge of the school and the mansion’s assets. Then as Foggy leaves, Juggernaut escapes from the Cyttorak dimension and arrives in the mansion. Juggernaut destroys Professor X’s machinery and the noise alerts the X-Men to his presence. Juggernaut demands to know where Professor X is and does not believe the X-Men when they tell him that the Professor is dead. In anger, Juggernaut attacks and defeats the X-Men. The villain then storms outside and finds Professor X’s grave. Juggernaut is distraught that he is now unable to kill Professor X himself. Meanwhile the X-Men regain consciousness and launch a new assault on the Juggernaut. 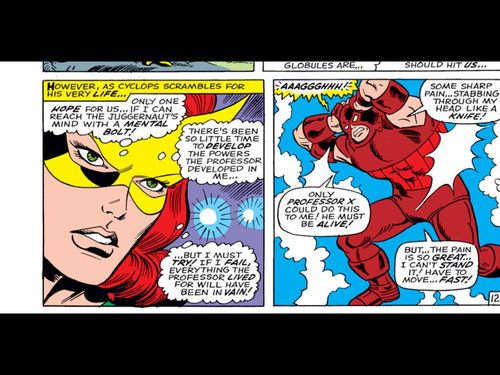 Jean is able to use her new telepathy to attack Juggernaut with a mental bolt and the evildoer is paralyzed. 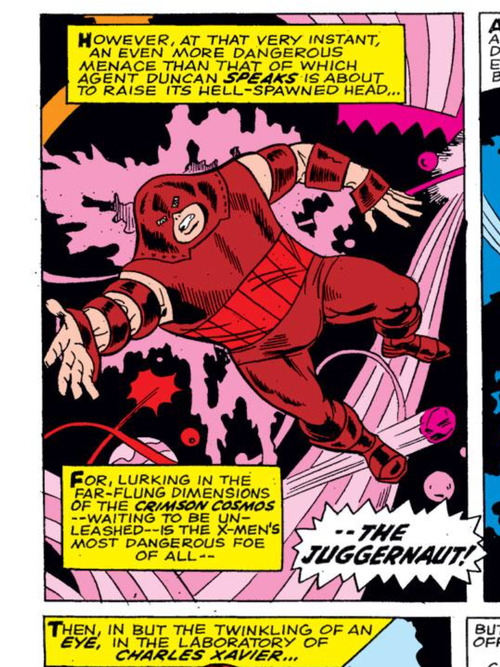 Juggernaut is then suddenly taken back to the Crimson Cosmos where he will continue to be a prisoner. 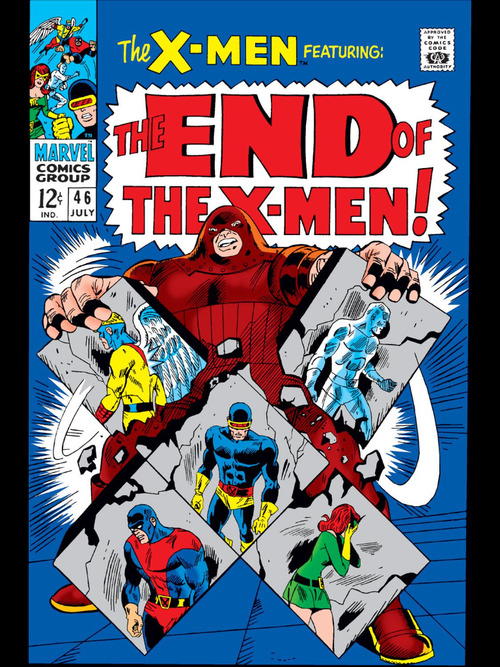 After the Juggernaut leaves, the FBI agent tells the X-Men that they need to split up as a team because it is too dangerous for them to remain together. The issue then shifts to the conclusion of Iceman’s origin story. 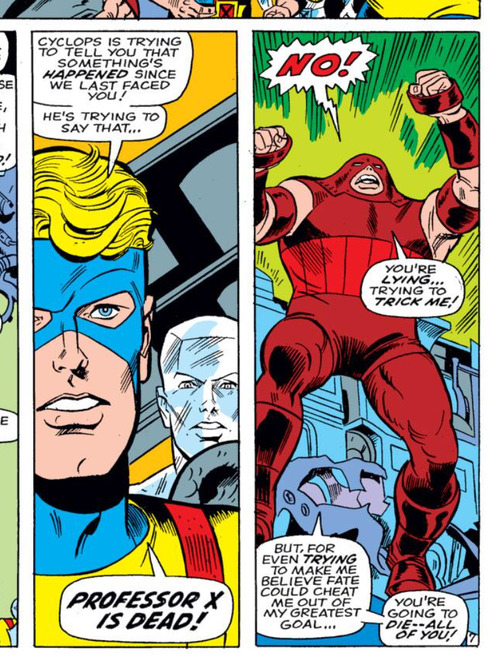 When the story begins, Iceman and Cyclops are the prisoners of an angry mob who is about to lynch them. 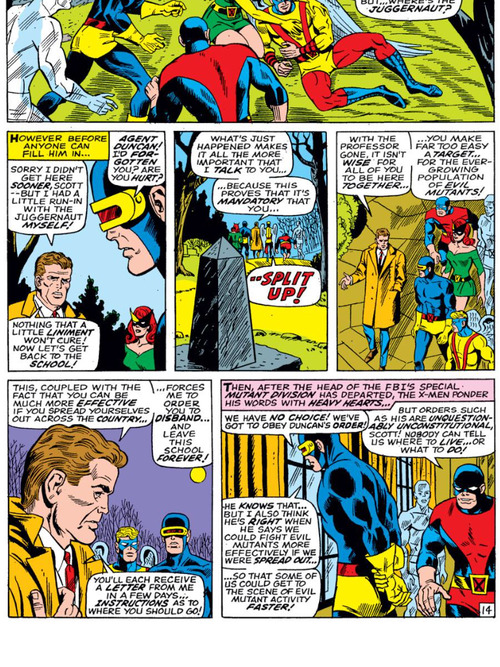 However at the very last moment, Cyclops and Iceman are able to escape. The two mutants then go to Xavier’s mansion where Bobby is accepted as the second member of the X-Men. This issue had some great moments, but it also had some flaws. I was very happy to see Juggernaut return, but I wasn’t satisfied with how his story ended in this issue. It seemed way too convenient that Juggernaut was randomly transported back to the Crimson Cosmos at the end of the story. They don’t even really explain clearly why that happened. My other problem with this issue also involves the defeat of Juggernaut. 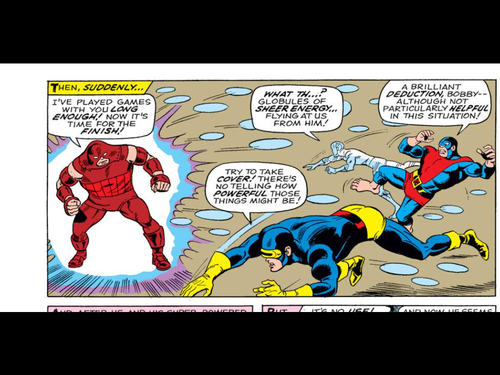 How is Jean able to use her mental bolts on Juggernaut while he is wearing his helmet? Doesn’t the helmet protect him from telepathic attacks? I was happy to see Jean use here telepathic powers for the first time though. I can’t wait for her to start developing her powers now and deal with the struggles that come with having telepathic powers. I enjoyed Juggernaut’s struggle to accept the death of Professor X, but a character as important as Juggernaut should not be so easily defeated. What I did really like about this issue was the conclusion of Iceman’s origin story. Bobby’s beginnings have been much more interesting than Cyclops’ origin and the ending of Iceman’s origin story did not disappoint. Even though there were some flaws in this issue, it is impossible to have a Juggernaut issue that is not enjoyable. This is not the best Juggernaut issue, but the comic is still better than a lot of Uncanny X-Men issues. 1. Jean has not been to college in a long time. Did the writers decide to quietly stop her college days without announcing it? 2. This is what the Crimson Cosmos look like apparently. 3. Since Agent Duncan disbanded the X-Men, he deserves this. 4. Juggernaut has this weird energy projection power in this issue and I’m not a fan of it. 5. 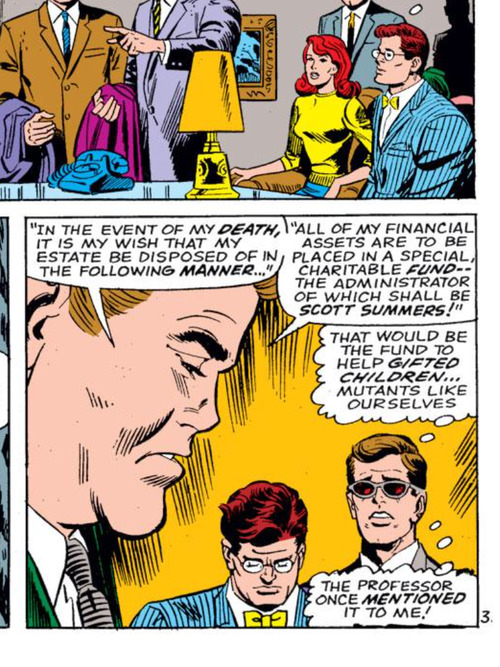 It looks like Jean and Scott won’t be together for a while. 6. At least the sheriff in Bobby’s town is a good person. I thought Juggernaut’s helmet rendered him immune to telepathic powers. Or has that not been established yet? That’s what I thought too. I think this issue was just cutting corners and trying to find an easy way to defeat Juggernaut. I hope this doesn’t happen again. As it’s Gary Friedrich and he didn’t write the original Juggernaut tale, my guess is he slipped up. 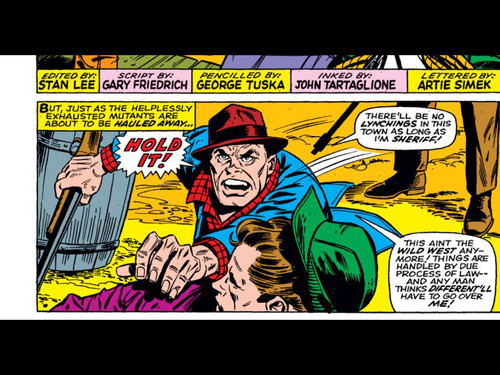 It’s common enough–even Lee and Kirby couldn’t keep their own continuity straight at times. 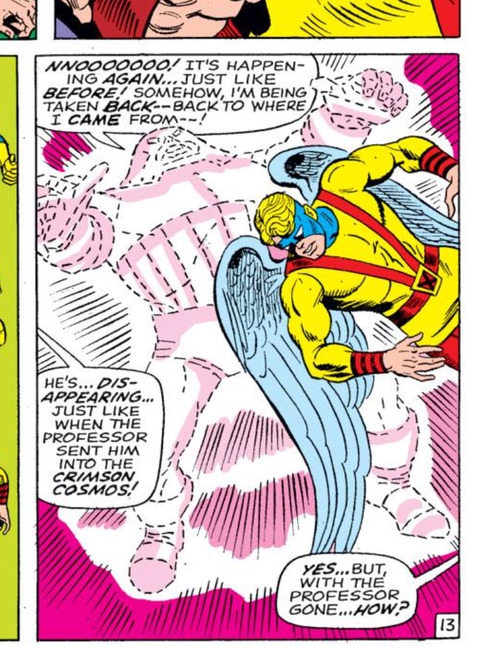 The Crimson Cosmos looks much like one of Dr. Strange’s alien dimensions (appropriate–Cyttorak is one of the deities/beings he can invoke), but like most attempts by people who aren’t Steve Ditko, it only makes me think how good Ditko was. Yeah you’re right it probably (and hopefully) is just a continuity slip up. These types of stories are always amusing in hindsight, knowing as we do now that there are literally hundreds of issues after the supposed split up. Side characters who are nice to the mutants always make me smile in X-Men stories. There’s a police officer who defends the X-Men and other mutants in God Loves, Man Kills as well. Haha yep, not a very dramatic split nowadays. And very true it is really great when people are nice to the X-Men for once. Just realized I meant to quote this portion in the second blockquote. At least the sheriff in Bobby’s town is a good person. There’s a nice scene like this in the X-Men: Evolution episode “The Stuff of Villains” (season 3, episode 4) as well. The cops realize Rogue and Kitty were just trying to help and were not working together with the Brotherhood. It’s possible Friedrich doesn’t know about how the helmet works. But isn’t it the Editor’s job to catch such errors? When you think about it, it makes no sense! No matter how strong Juggernaut is, he has no chance against his step-brother unless Xavier can be stopped by his helmet! And of course there’s Jean! 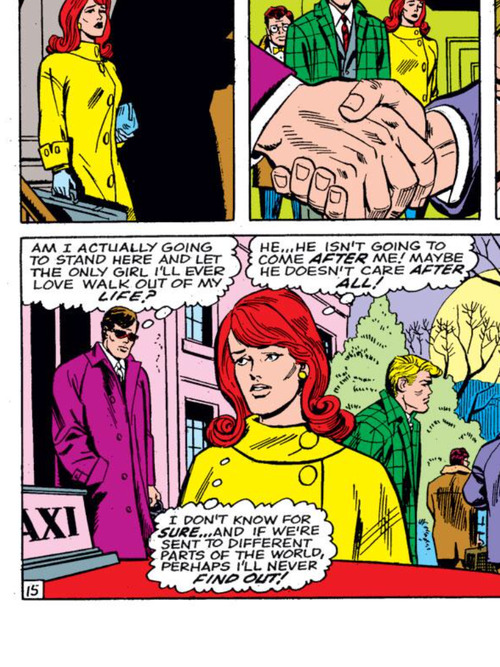 Cyclops thinks that Jean is the only one he’ll ever love. It is natural to feel things like that. But we know that later he marries Madeline Pryor and later still he takes up with Emma Frost. Apparently Ditko is still alive, but he can’t be tempted back into doing this kind of thing any more. And I think Stan Lee is the one who edited this issue! Ridiculous mistake. Stan was not a meticulous editor. At one point he switched the name of Bruce Banner to Robert, and that was in his own story. 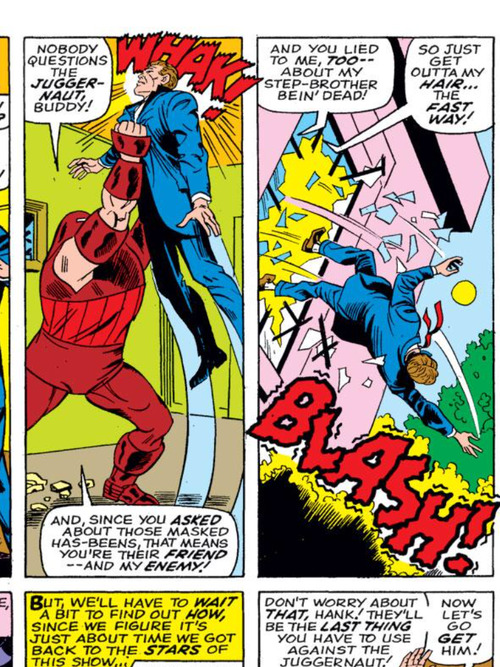 In another story, Giant-Man starts by telling the Wasp he’s lost his shrinking powers, then saves himself at the end by shrinking, no explanation. So it’s no great stretch he’d lose track of a detail like Cain’s helmet. I think Stan randomly changed FBI agent Fred Duncan’s name to Amos Duncan too in a recent issue I reviewed. It’s amazing how bad of an editor he can be at times.